What a great start to the working season with perfect weather to tackle the overgrowth and the challenges the summer months had mustered up for us. 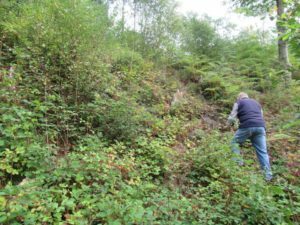 Additional heathers were added to the ‘Guideling Bank’ in 2015 and we last tried to clear brambles and fer ns about 18 months ago. 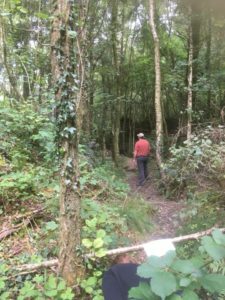 We interfere as little as possible with nature but the heathers offer an attractive diverse flora to this area of the site. Said Vernon – Trustee and active volunteer. 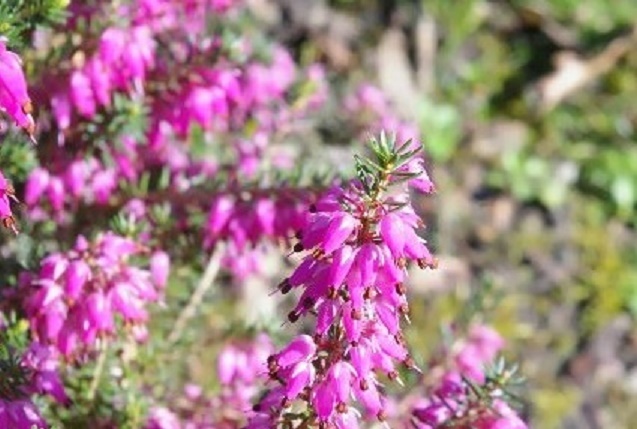 Heather is also called ‘Ling’. You can find it on heaths, moors and bogs, where its delicate, loosely arranged pink flowers attract all kinds of nectar-loving insects. Abundant in woodlands with acidic or peat soils, it’s delicate pink flowers appear from August to October and are a contrast to the tough, wiry, sprawling stems they grow upon. Plants grow tightly packed together and can live for up to 40 years or more. We also felled some trees that became unsafe during the odd weather we had this summer. If you’d like to join us to help we are at Coed y Werin every Sunday morning between 10 and 12 (weather permitting) come and say hello!